Can you believe it’s been a year since this cake? Its always a scary reminder how quickly my nephew is growing up. My nephews list of likes has recently expanded due to a certain aunty () introducing him to the wonders of Nutella, he also really likes Oreos (what is it about nutrionally devoid food that makes it sooo delicious?!). 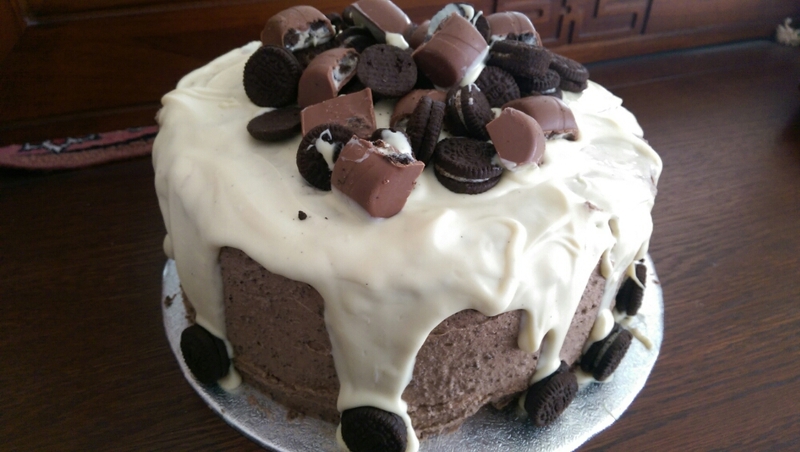 However, he still wanted his cake to be vanilla and white chocolate. Apart from the usual computer games that most 9/10 year olds seem to be obsessed with, my nephew loves Snow Leopards and can tell you all the facts about them. 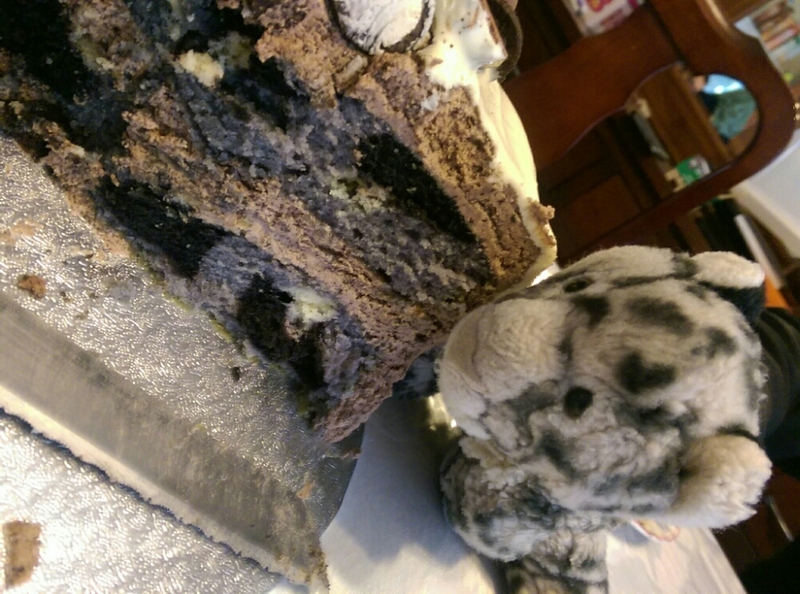 So a vanilla cake, with white chocolate, nutella, oreos and a hidden suprise of a snow leopard. This was actually a no brainer…. 175g unsalted butter creamed with 250g golden caster sugar (cream for about 5mins til pale and fluffy, with golden caster sugar the mix will remain grainy). Whisk in x4 eggs and 2 teaspoons of vanilla essence (I add each egg separately with a teaspoon of flour to prevent curdling). 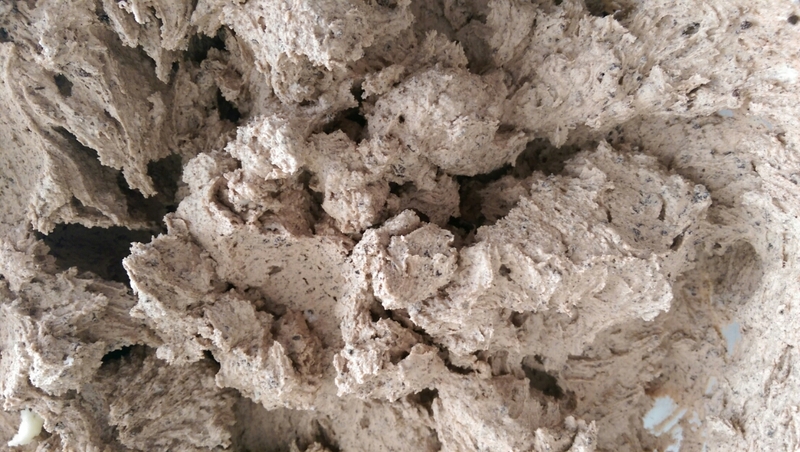 Sieve in 250g self raising flour and 1 teaspoon baking powder, fold in gently. Mix in 75g natural yoghurt. I then separated the mixture 1/2 into one bowl with a small amount of Wilton black gel food colouring to get a nice grey, 1/4 with some cocoa powder and black gel colouring to make the mixture a dark grey and the remaining 1/4 I kept plain. They were baked until a knife poked through the centre came out clean (fan assisted oven at 170deg). To see if I had achieved the desired affect meant waiting until the cake was cut! 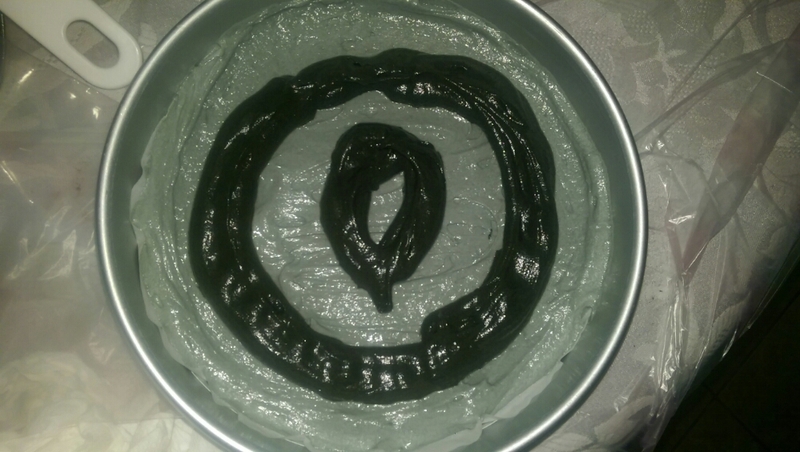 To decorate I made a Nutella-Oreo frosting. A 250g bar of unsalted butter was whisked until smooth, I gradually added 500g of icing sugar. Once fully incorporated, whisk for aprox 5mins til smooth and fluffy. Add a tablespoon or two of milk (until you achieve the consistency you want), I then whisked in 3-4 tablespoons of Nutella and a pack of Oreos which were blitzed in the food processor. The frosting became quite stiff so I added more milk til it had a spreadable consistency. 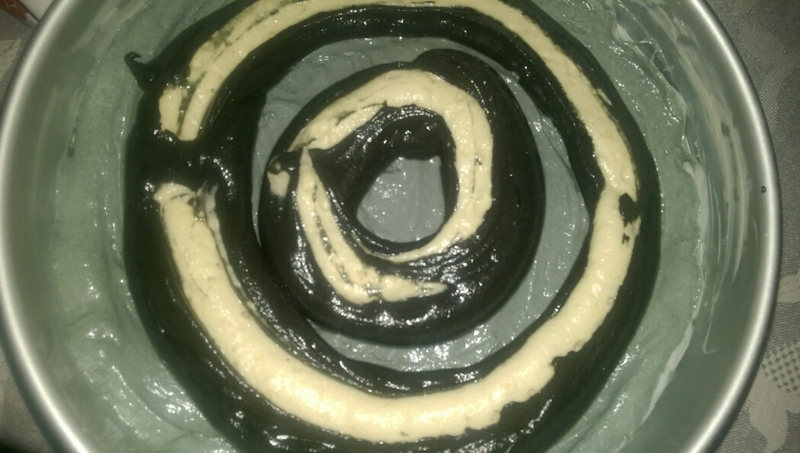 This frosting is amazing . There was enough to fill and cover the cake with a generous amount of frosting (there was a lot of frosting,I could have saved it for another cake, but I know it would have ended up being eaten with a spoon :oops:). 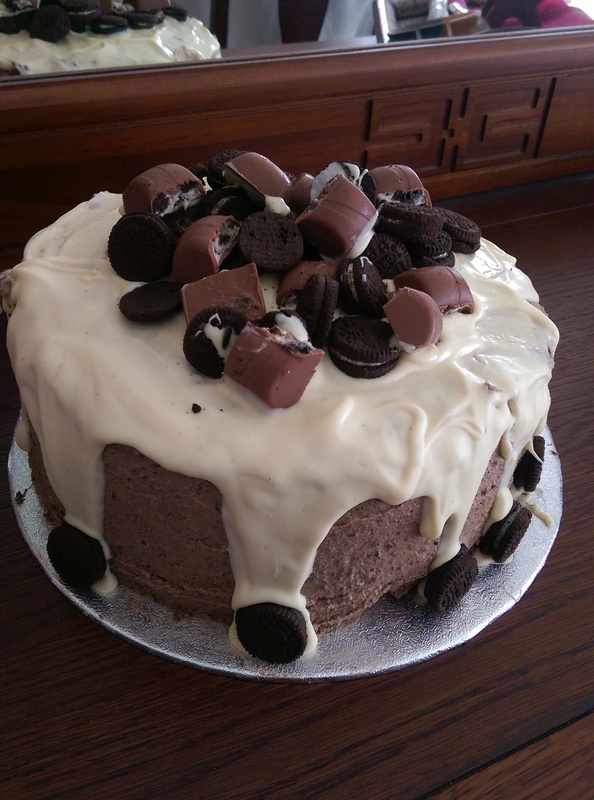 To finish the cake I poured over some melted and cooled white chocolate to achieve a dribbled effect and decorated with mini Oreos (can you believe they don’t sell these anywhere in the UK? I had to order them from Amazon for a silly amount of money) and the very delicious Cadburys Oreo bar. I was really happy with the final cake and my nephew couldn’t wait to cut his cake. He was sooo suprised with and loved the snow leopard design inside…. 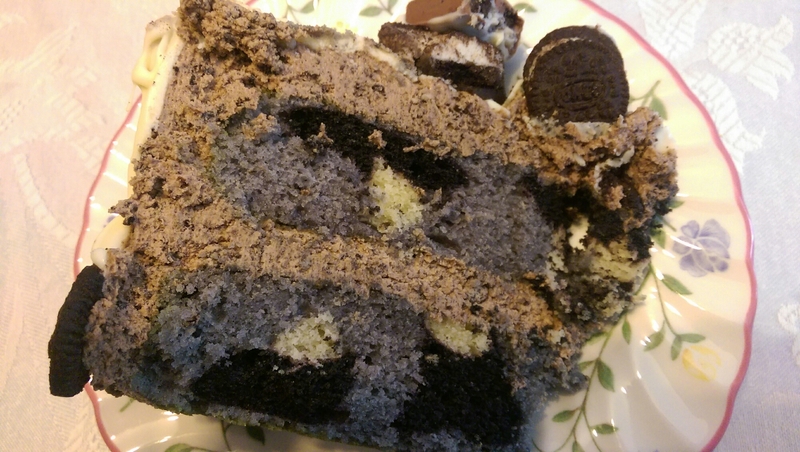 This entry was posted in cake and tagged birthday, birthdaycake, home a, homemade, leopard, nutella, Oreo, snowleopard on July 29, 2015 by maryambakes.